Details from the Alsco/Linens of the Week Redevelopment Meeting | Park View, D.C.
On Wednesday evening (August 13, 2014), at the 4th District MPD Substation at 750 Park Road, the Holladay Corporation made their initial presentation to members of the community about their plans to redevelop the property on Lamont Street, NW, currently housing Alsco (formerly Linens of the Week). Alsco is currently in the process of developing a new location in Maryland and is planing to move to the new location in late 2015. The Holladay Team with architect Eric Colbert during the presentation. The team was lead by Holladay Vice President Lee Weber. Also prominent among the team was architect Eric Colbert. Holiday described the overall project as having 225 units of housing and 102 parking spaces, which should give a good sense of its scale. It breaks down into three parts, labeled in the above perspective and the below map as “A”, “B”, & “C”. An additional area of land involved is currently a parking lot on Morton Street, but is not part of the current project. I have labeled it “D” for reference. The Morton Street lot would be developed at some later date. (Map showing location of Alsco property on Lamont Street. Areas labeled “A”, “B”, and “C” are included in the current development proposal. The area labeled “D” would be developed at some later date). Holladay stated that their intent is to save as much of the existing structures as possible. Currently, section “A” is a surface parking lot for Alsco. This area would be developed to have a 3-story, 9-unit building along Lamont Street and include 14 parking spaces at the rear. The building would have a total of 9,600 sq. ft. Section “B” is the 4-story building constructed in 1925. The plan is to create 77 living units in this building. No parking would be included in this section of the project. Areas would be cut out of the east and west facades to permit light into the new units. This structure would have around 68,784 sq. ft. Section “C” is — in my opinion — the most interesting part of the development. It would have about 117,886 sq. ft. of space for 139 units. This is the oldest of the buildings, originally erected ca. 1920. The 1-story facade would be retained and restored and the original entrance would be returned to how it looked when the building was first completed providing a prominent entryway. 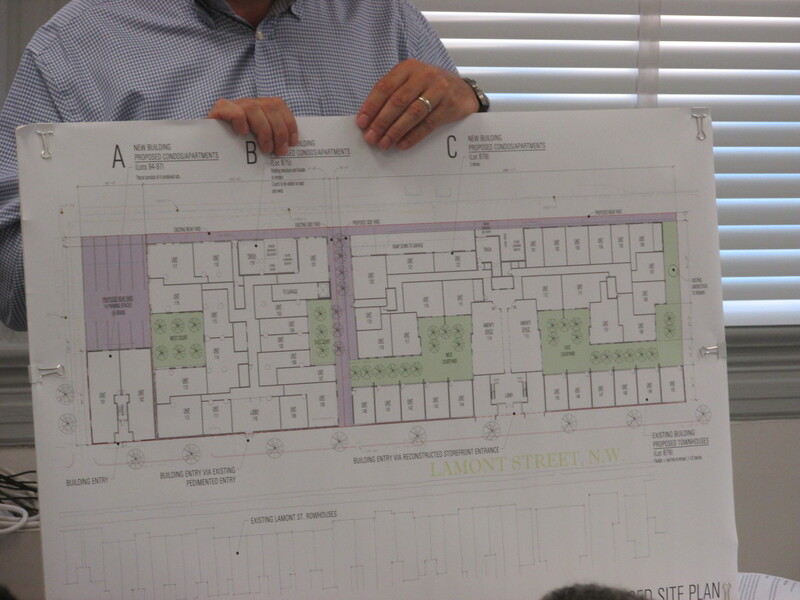 The Lamont Street section would be developed into townhouse-like living units. The remainder of section “C” would be razed and excavated for a single level of underground parking containing 102 parking spaces. 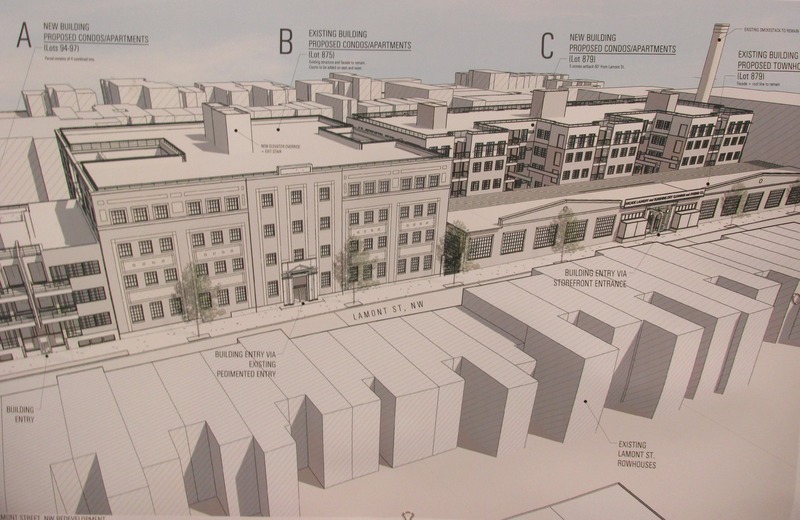 A larger building, which appears to be no higher than the 1925 building to the west, and certainly no higher than Lamont Lofts to the east, will be constructed above the parking lot. The taller building is set off from the single story Lamont section by open courtyards, and has been sited so that it is just as close to the front of the houses on the south side of Lamont Street as it is to the rear of the houses on the south side of Morton Street. Q: How does the new building relate to Lamont Lofts? A: The building is 12 ft. away from the building. Q: Would construction be in phases, or all at once? A: All at once would make the most sense. Q: How long would construction take? A: Estimated to take 22 months to build once construction begins. Q: How will the building impact sunlight on my property? A: There will be no impact on residents on Sherman Avenue or behind the 1925 building. The new building would have a similar effect as the 1925 building does now. Q: Will these be condos or apartments? A: Both, but the exact number of each is not known at this time. Q: How many affordable units will there be? A: At least 15. Q: What will the roof be like and will it be accessible? A: At least 50% must be a green roof, though its too early in the planning stage to know exactly how much and if it will be accessable. Other questions — such as how many units would be 1- or 2-bedroom, or if any would be larger — just could not be answered during the meeting due to the early stage of the planning at this time. 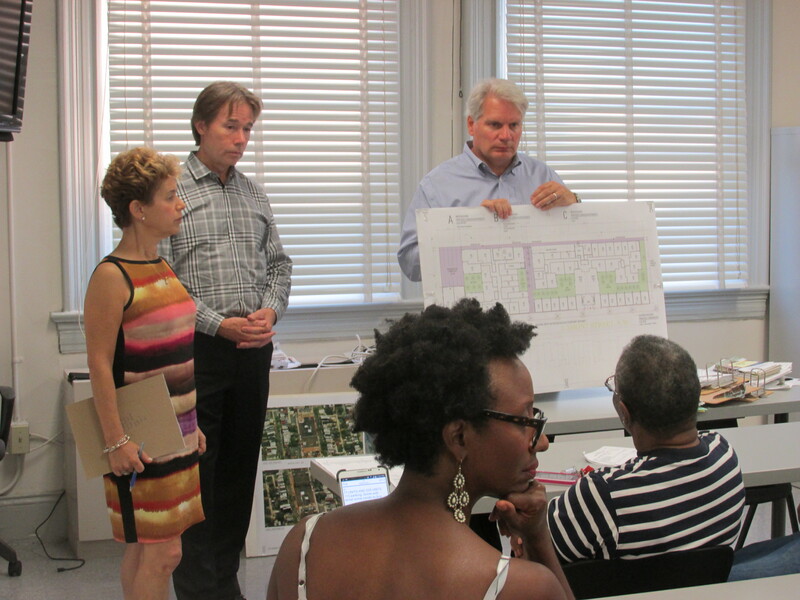 The team will next make a public presentation at the September 10th meeting of ANC 1A. They also agreed to coordinate with the ANC and community for additional public meetings as the plans become finalized and the project gets closer to a start date. (Presentation board showing overall footprint of the plan, including the inner court areas). This entry was posted on August 14, 2014 at 12:08 am and is filed under Architecture, Development, Housing. You can subscribe via RSS 2.0 feed to this post's comments. I often ride by the properties and could tell that a nice entryway had been ruined at some point. I will miss the factory sounds – so rare in this city that produces no things. As a resident of Lamont Lofts, with my bedroom wall directly adjoining the laundry, I will not miss the factory sounds and especially will not miss the lint, which I believe has gotten much worse under ALSCO than it was under Linens of the Week. Maintenance of the laundry buildings has also been horrifically shoddy — the gutters spray water all over the sidewalk when it rains, and the roof caught fire not long ago. The new project looks great to me, although I wish it could stand farther than 12 feet away from Lamont Lofts. This is awesome. Please support.